Moving In With Dementia: Am I In Denial? I work as a nursing assistant with the very elderly. There is no way to kindly keep telling the truth, the whole truth and nothing but when you are dealing with dementia. 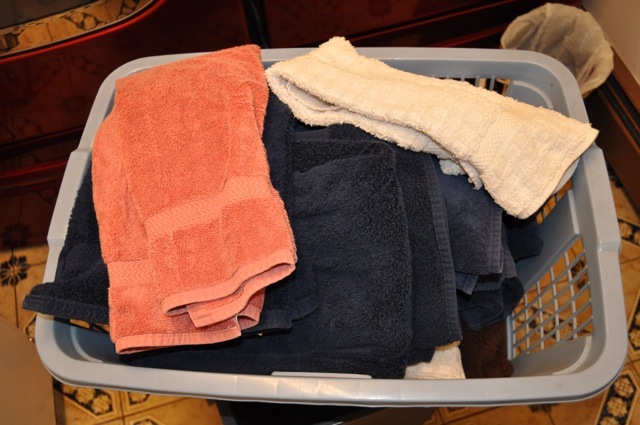 The towel folding, for example, calms people with repetitive motions and it makes no difference if you fold 50 towels once, or 5 towels each times 10. Since dementia isn't going to get better, the most important thing is to be kind and consoling. Your reality is not what your mother is experiencing. Guilt has nothing to do with medical necessity...helping your mom be as happy as you can, and as calm about her reality as is possible, is your highest good. As we lose touch with facts, what remains are feelings. Folding towels creates a feeling of contentment. The "fact" of unnecessary folding is trumped by the "feeling" of calm contentment, IMHO. As you journey with your mom, you will learn that the "truth" is what brings comfort, peace, and security in the moment. It is also what allows you to keep your loved one safe and secure. This, to me, is the essence of inherent worth and dignity as it applies to people with dementia. Your mom's reality is not yours. She experiences herself as still competent and not in need of help. You realize this is not the case. She is not likely to ever recognize her own needs due to the dementia damage to her brain. She is unaware. Google the term "anosognosia" to learn a lot about this phenomenon. Some dementia patients eventually ask to see their own long-dead parents. In my opinion, it is cruel to tell them over and over that their parents are dead. This only causes them to relive the grief, or causes extreme distress. Instead, a "loving lie" that "dad is working in the garden, you'll see him later" repeated over and over as needed provides comfort and peace in the moment. What may be considered immoral when dealing with a person with full cognitive abilities may well fall into the realm of immoral and cruel with dealing with someone with dementia. Vikki: I like your comment about guilt having nothing to do with a medical necessity. It helps put things in perspective. Chip: I like hearing what others think! I am trying to focus more on the feelings rather than fact. As you know, that is often a ministers job in such situations, but they always say you can't minister to your family :-) I keep reverting to trying to fix things. My CPE training sometimes flies right out the window. Rebecca: Reading about anosognosia was quite helpful. It helps me understand that Mom's reasons for not seeing the reality of her situation are clearly different than mine, which is sometimes denial because of fear. I also like how you say: "'truth' is what brings comfort, peace, and security in the moment." To all of you: Thank you so much for your helpful and kind comments! They truly make a difference. I don't know if your mother is still alive, but I just went through end-stage Alzheimer's with my mom and she finally died in May. When mom's mind really started to get bad, she began repeating the same questions again and again. Nothing that anyone said to her would stick, and we finally figured out that it just didn't matter how we answered the question. She wasn't going to retain whatever we said, so the best thing was just to give as brief an answer as possible. People change dramatically with Alzheimer's, and at some point you just look at the person and can't believe this is happening. You wonder if your real mother is hiding somewhere in this stranger's mind. Other people can tell you about it, but you have to experience it for yourself to understand how much it hurts. It is impossible to preserve the person's dignity and continue treating them as if they are a competent adult, so you have to adapt in whatever way you can. It's very painful to be forced into a situation where you have to deal with the fact that your parent is totally incompetent and can no longer remember how to do the simplest things, even take out their dentures or feed themselves. Fortunately at some point they lose all awareness of their own medical condition and what's happening doesn't really bother them that much.